The Board and Friends-led match is ON!! 3. and a corporate matching gift will match your annual gifts once again, both single and monthly! NEW for Returning Members and Supporters: FFL’s Welcome Back Kit! 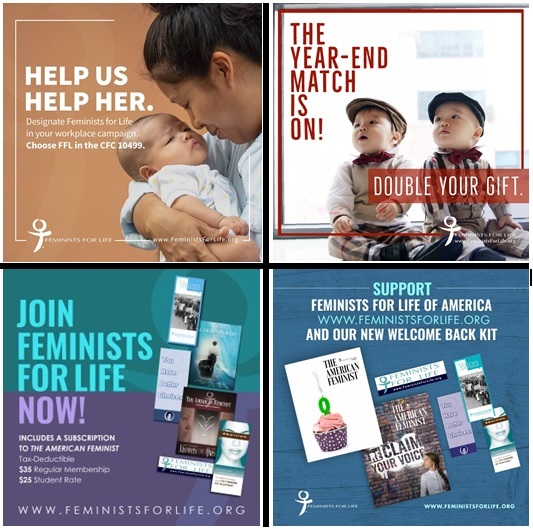 Right now, returning members and supporters will receive “Abortion: Nothing to Celebrate” and “reClaim Your Voice.” You will ALSO receive our brochures: “Voices of Our Feminist Foremothers,” “You Have Better Choices,” an FFL bumper sticker and our informational brochure which explains what we do and why! Feminists for Life is a 501 (c)(3) organization – all donations are tax-deductible for IRS purposes and includes subscription to The American Feminist®. You may choose from: a one-time gift, an annual gift, a quarterly gift, or a monthly gift. Sustaining donors provide essential support through monthly donations! This is one of the most meaningful and effective ways to give. Membership benefits are included so you will also receive our welcome kit if new, welcome back kit if returning, and subscription to The American Feminist.® Or you may make a gift in tribute or memorial. To make any of these donations online, please click here. If you would prefer to mail in your donation, you have a few choices. • You may sign up for monthly Electronic Fund Transfer (EFT) by printing out the form found here. Please mail the completed EFT form with a voided check to Feminists for Life, P.O. Box 151567, Alexandria, VA 22315. • To contribute by check, please print this Check Donation and/or Membership form. • To contribute by credit card, please print this Credit Card Donation and/or Membership form. If you are a federal civilian employee, employed by the postal service or in the U.S. Military, please contribute to Feminists for Life via the Combined Federal Campaign. We are listed in the Women, Children, and Family Service Charities portion of the directory. Feminists for Life’s CFC number is 10499. Corporate employees may write us in the Workplace campaign. Ask your on-site campaign coordinator for more information. No matter how you give, WE THANK YOU!